After the enumeration took place, a layout plan of the reblocked settlement was created. The city planned public services first, before designating plots or shack sizes. The city’s main responsibility is providing adequate public services to the residents in the community. Therefore, engineers in the city began the layout plan with major infrastructure elements including the location of sewage, water lines, drainage pipes, and access roads. This layout plan was then submitted to contractors for a bidding process. When we arrived in the settlement, these layouts had already been solidified and a contractor selected. An important lesson learned through our project, was that this steps could cost the city a significant amount of money and time, especially if the layouts are modified later on the process and resubmitted to the contractors. If the process were replicated, it would be beneficial to finalize these plans earlier in the reblocking process. Once the initial infrastructure layout was completed, CORC then facilitated an exercise for the community to organize plots and shacks. CORC used the infrastructure map with proposed plots and cardboard pieces that the community arranged in a way that benefited everyone. By involving the community in the spatial layouts from the beginning, Flamingo Crescent was able to solidify a detailed layout plan. Although this was a good workshop, it later showed inconsistencies when taken into the AutoCAD file. Balancing the infrastructural layout with the desire of the community to prevent variables during construction was one of the main challenges presented throughout our project. 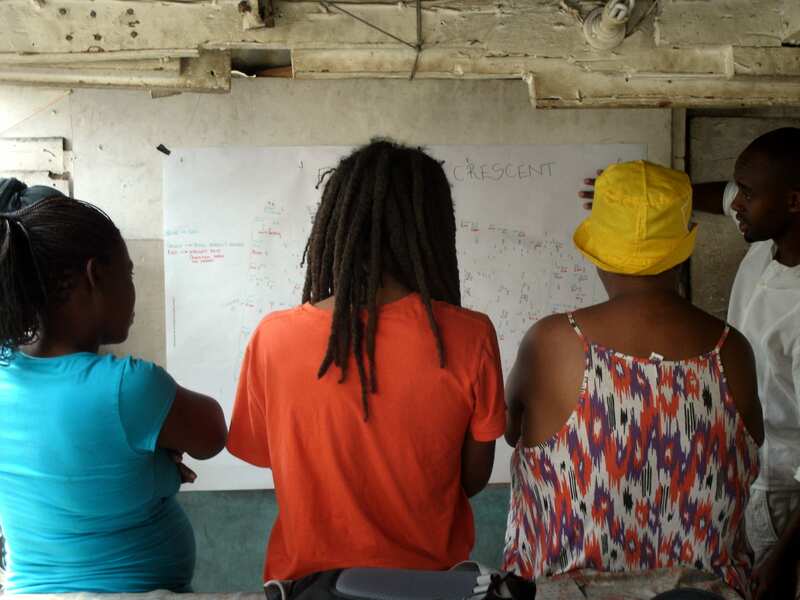 The Flamingo Crescent CAD team, with the assistance of CORC, worked with the community rearranging shacks and generating new CAD layouts. The community leaders critiqued the special design and arrangement of shacks, explaining conflicts between neighbours, sometimes bringing in residents to approve their proposed neighbours, as well as location of doors and toilets. 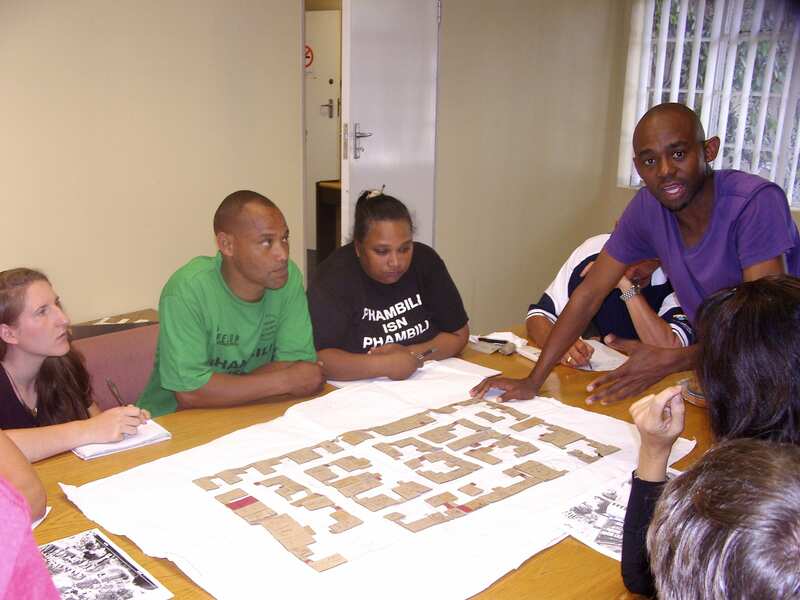 The community leaders also made great contributions identifying open spaces for crèche and park areas. We identified a few effective strategies for this process included using large prints of the current map and highlighters, and bringing a computer to work with AutoCad on site. These enhanced visualizing the considered changes and allowed the community leaders to check the feasibility of the changes as they happened on the CAD layout. We also ensured that all residents were in agreement with the final layout. Some changes needed to be made balance the infrastructural design, with the toilet location, door orientation and cluster denotation. The final draft of the layout was printed and signed by all community members. This copy was laminated and left in the community. By signing the layout, residents commit to the shack arrangement, their neighbours, and toilet placement as it is on the map. We hoped this activity will avoid problems in the future during the construction phase, explained in the following section. Read about the beginning of construction in Flamingo Crescent here.